Are you ready to take your business to the next level? If you've got a product to sell there's only so much growth you can sustain by selling directly to end users. The ultimate key to really developing your business into a bigger enterprise is to get it sold by retailers. But how do you convince a cautious retailer and give a great outward impression of your business, big or small? 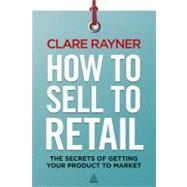 Working through a series of 5 logical sections broken down into 12 steps, How to Sell to Retail will teach you how to look big, plan big, pitch big, get big and stay big though successfully selling to retailers.